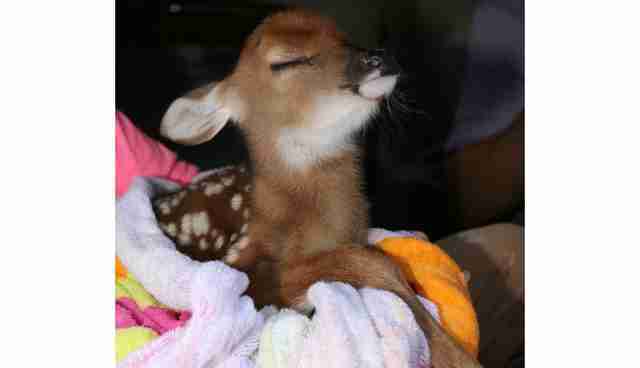 "Seeing that fawn lying there was such a sign of peace and hope." Scott Black had been at work since 6 a.m. - and nearly 14 hours later, he was finally leaving. Rising floodwaters last Tuesday had kept the pharmacist and amateur photographer holed up in his Louisiana office. It didn't flood, but the water was getting uncomfortably close. "Approaching our building but still a mile and a half to two miles down the road," Black tells The Dodo. "It was rising slowly but steady and we did have some concern of the water getting to us." Just about half an hour from Baton Rouge, there was plenty of devastation in this community. There were also plenty of folks rising to the occasion, helping their neighbors - including the animals. Black saw, and captured, one such powerful instance as he was leaving work that day. A pickup truck pulled into the parking lot, as Black was walking to his car, to finally go home. The driver was a guy Black's seen around town - they go to the same gas station. "He stopped and I told him hello and he pointed for me to go to the passenger rear door to see something," Black says. 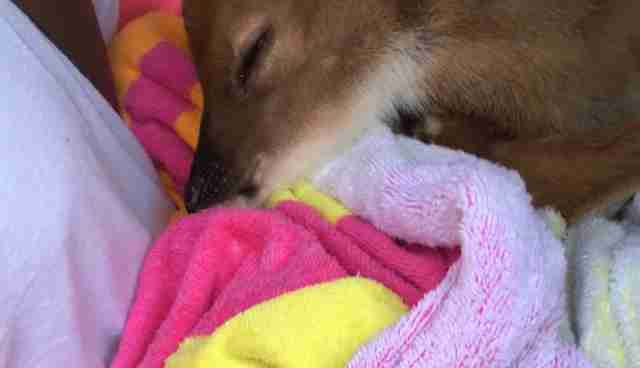 There was a baby deer, who'd been rescued from the floods. The men in the truck told Black they'd been out surveying roads. Someone in a boat approached, saying he'd found the tiny creature but had to go back out for more rescues, "and there wasn't anything he could do with it," Black says. 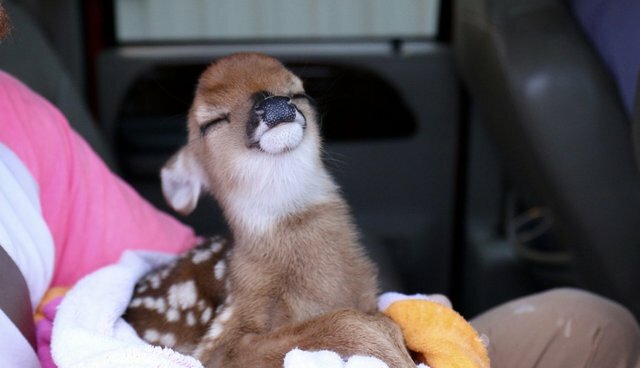 The deer seemed, Black says, both exhausted and also "amazingly content." 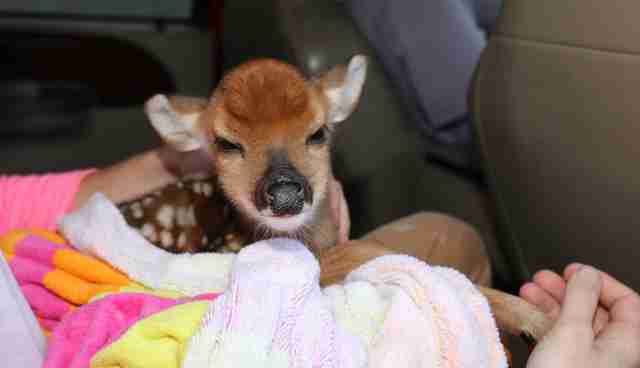 "It was amazing to see this tiny fawn just lying in someone's lap," says Black. He snapped a couple of photos on his phone, then went to the car for his good camera. The deer began to pose, it seemed. Black got these wonderful pictures. 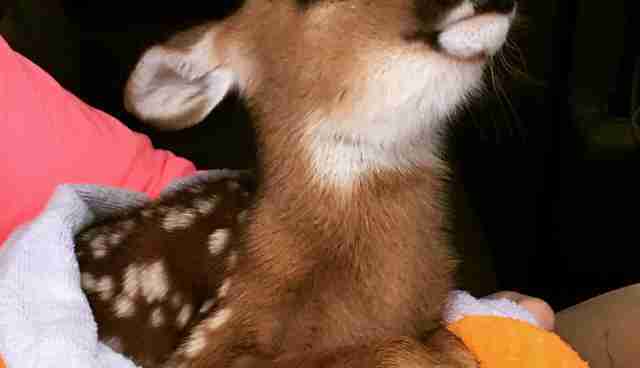 "It had been a long day and I had family, friends and employees that had been flooded so the mood was somber at best, but seeing that fawn lying there was such a sign of peace and hope," he says. There are a lot of moments that Black wishes he'd been able to shoot with his camera, over the last couple of weeks. Moments that show how strong, resilient and good his community has been during this devastating time. 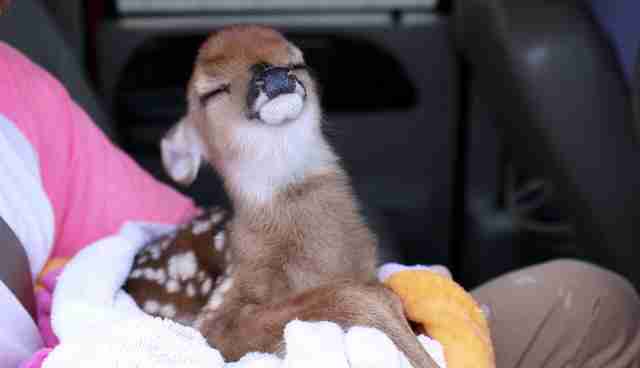 People helping each other, and helping pets, farm animals, and wildlife, "all rescued in amazing manners," he says. "I've seen so many images of disaster and of rescues of humans and other animals alike. I would love to have captured each and every one on camera just to let people see what has happened here." 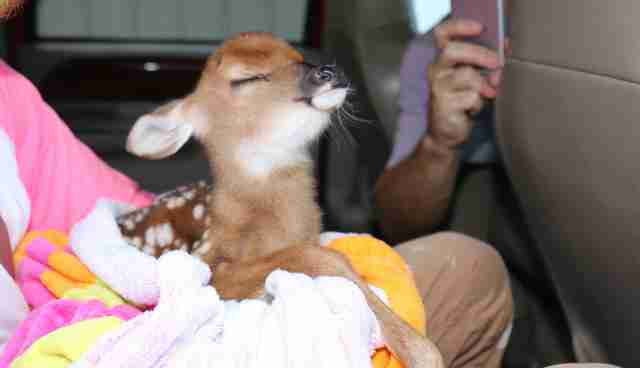 Last Friday, Black again ran into the man who'd saved the deer, at the gas station they both frequent. The man told him that the baby had been taken to a local farm. He'd stayed in touch, and heard "it was being bottle fed," Black says. "And doing well so far." You can donate to help animals displaced by the Louisiana floods here.